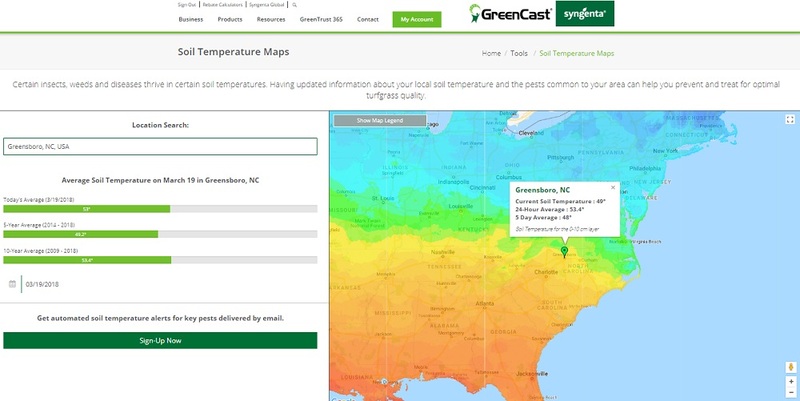 Access archived temperature maps for anywhere in the U.S.
GREENSBORO, N.C., USA, March 20, 2018 – To help turfgrass managers stay ahead of key weeds and diseases, Syngenta has introduced Soil Temperature Alerts available on GreenCast® Online. This allows subscribers to track soil temperatures anywhere in the U.S., receive personalized alerts on potential pest activity and access 10 years of soil temperature archives. Track soil temperatures anywhere in the U.S. and receive personalized alerts on potential pest activity. Real-time soil temperature alerts can help turf managers monitor pest outbreaks so they can better plan product selections and application timing to ensure their turf performs at its best. In addition to the eight pre-determined pests, subscribers can customize their own soil temperature alerts. Sign up to receive email or text alerts when target soil temperatures reach the pre-determined thresholds in your area for eight different spring or fall pests. To sign up for text and email alerts for your personalized soil temperature thresholds and diseases, visit GreenCastOnline.com. ©2018 Syngenta, 410 Swing Road, Greensboro, NC 27409. Important: Always read and follow label instructions. Some products may not be registered for sale or use in all states or counties and/or may have state-specific use requirements. Please check with your local extension service to ensure registration and proper use. GreenCast® and the Syngenta logo are trademarks of a Syngenta Group Company. All other trademarks are property of their respective owners.